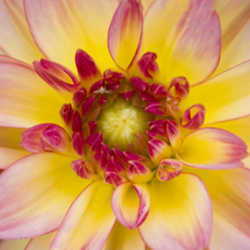 Dahlias offer gardeners a wide range of flower sizes, colors and types. You can plant spectacular dinner plate dahlias for show-stopping garden centerpieces, or add diminutive small dahlias to a window box, planter or garden border. The basic planting and care instructions for each type of dahlias are similar, so once you've learned how to care for dahlias, you can grow nearly any type your heart desires as long as they're appropriate for your gardening zone. Most gardeners group dahlias into three general categories based on flower size and growth habit. • Large-flower dahlias offer huge flowers the size of dinner plates. Such dahlias offer flowers than range from 10-12" or more across; plants grow to be several feet tall. They are often grown as specimen plants, against a building or fence, or at the back of the flower border. Large-flowering dahlias bloom in the late summer throughout the fall. • Medium-flower dahlias, as the name suggests, have flowers that find a middle ground between the small and large-sized flowers, and are often easier for gardeners to cultivate because they require no special stakes or supports. They are sometimes called border dahlias because they can be planted along a walkway or edge of the garden to act as border flowers. Medium-flowering dahlias grow to be approximately one to two feet tall with medium-sized flower heads. 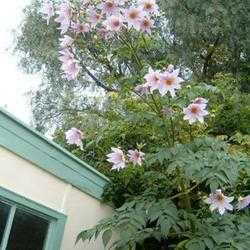 • Small-flower dahlias are the tiniest among the various sizes of dahlias, rarely reaching heights above 10 to 20 inches. They also tend to form compact mounds instead of tall, lanky plants, making them ideal for container gardens. Dahlias are grown from tubers. Tubers are sold in individual packages in the spring at garden centers nationwide. When planting dahlias, save the packaging materials, especially the label that contains the planting instructions and picture of the flower. Make a plant label with the name of your new dahlia. Dahlias must be lifted or dug up from the garden at the end of the growing season and stored indoors, and keeping the packaging materials will help you mark and identify stored tubers for next spring. You can tape the picture to the storage container or bag for quick identification. • Location: Dahlias need full sun and well-drained soil, so choose your location accordingly. Full sun is defined as six or more hours a day of bright, direct, full sunlight. • Soil: Dahlias are heavy feeders, so amend the soil before planting. They prefer a soil pH just slightly acidic, around 6.5. A soil test conducted by your local Cooperative Extension Office not only identifies the pH of the soil but also analyzes soil nutrients and composition. The Extension Agent can then recommend amendments to grow optimal dahlias based on your soil test results. • Fertilizer: Compost and well-aged manures can also be added to the garden bed as long as they are worked into the soil prior to planting. Many dahlia growers recommend a low nitrogen fertilizer worked into the soil about a month before you plant your dahlias. A 5-20-20 or similar fertilizer is good for dahlias. • Dig the planting hole about six inches deep and backfill it with peat moss and soil so that the tuber is just about two to four inches below the soil surface. Plant the tuber so that the crown is just about level with the soil. Once you have the tuber in position, pat the soil around it gently and add a good layer of mulch to retain moisture. • Space large-flowering dahlias at least a foot apart and up to three feet apart. Medium-sized dahlias can be spaced about a foot apart or a little less, and small dahlias can be placed six inches apart. • If you're growing large-flowering dahlias, place the support stakes around the dahlias when you plant them. Add a plant label near the newly planted tuber so you can identify it correctly. 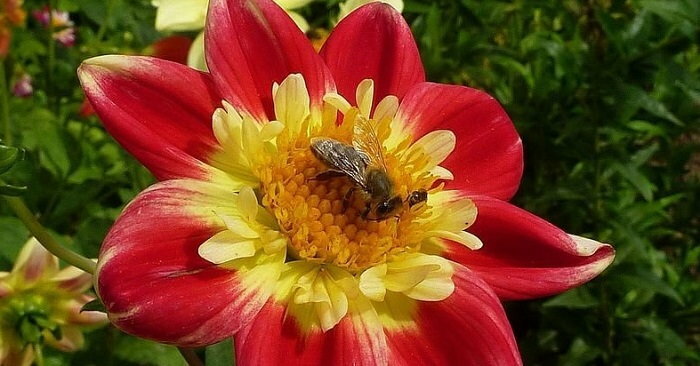 • Fertilize dahlias monthly until about the middle of August, and then stop fertilizing them. This prepares them for blooming and rest during the winter. • Water your plants well, and use mulch to help retain soil moisture. After your dahlias have flowered and before the first frost for your part of the country, you must "lift" or dig up your dahlia tubers and store them in a sheltered location over the winter. If they freeze, they won't return next year. • Remove stakes and ties holding plants to stakes. • Cut back the plant, including the foliage. Leave a little stem about three inches tall. 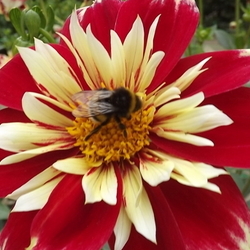 • Dig around the plant, being careful to extend your area around the base of the dahlia plant. The roots spread out near the surface. • Remove the tuber from the soil. Shake gently to remove excess soil. • Label the tubers so you don't forget which variety it is! • Hang them upside down to dry, and brush off any remaining soil with your hand. • Use your scissors or gardening shears to cut off any extra roots from the tubers. Dusting tubers with sulfur before storage prevents diseases. • Place clean, healthy tubers in a bushel basket, wooden crate or cardboard box lined with vermiculite or peat moss. Cover with an inch or two of the same material, but leave a little bit of the stem exposed. • Store in a cool area at around 45 degrees F until you're ready to plant them next spring. Check them occasionally during storage to make sure they aren't drying out. If they start looking shriveled, sprinkle a little water on them. Not all of the tubers will survive, but some should, and you can plant these again in the spring around March or April when the ground begins to thaw. For more information on growing dahlias, visit your local Cooperative Extension Office or the American Dahlia Society website.